By LaGayle ~ August 20th, 2012. Creole and Cajun meals are among my favorites. As I have mentioned before in various posts, the Wine Peeps love spicy foods. John and I recently spent several days in New Orleans celebrating our 44th wedding anniversary and had the opportunity to enjoy some fantastic food! On the way to the airport to return home, we had a great visit with our cab driver, and the conversation turned to food. When he learned of our love of spicy foods, he started sharing recipes with us. Sip It is one of those recipes, and I can tell you the name comes from the spiciness!!! You have to take or â€œsipâ€ small bites. 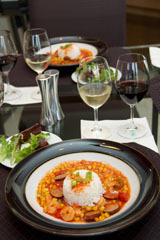 The dish is similar to a stew in texture; however, the ingredients are another story. Sip It contains shrimp, smoked sausage, corn, tomatoes, tomato sauce, sugar, Creole seasoning, and pickled jalapenos including the jalapeno juice. It can be eaten as is or served with rice. For this challenging wine pairing, we included rice in our meal along with a mixed green salad with green onion dressing. Absolutely fantastic! On a side note, we were told that other ingredients such as lobster or crawfish can also be used in this recipe. And, for the faint of heart who do not like as much spice, the jalapenos and their juice can be omitted or the amount reduced. As always, once the menu was prepared, the question became, â€œWhat wines should we drink with this meal?â€ As we talked about the dish and ingredients, we decided to try both a white wine and a red wine to see which would pair better. 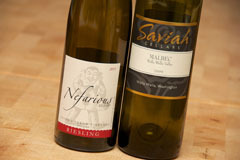 We selected the 2011 Nefarious Cellars Riesling and the 2009 Saviah Cellars Malbec. While both wines were very good with the food, we thought that the Riesling was the better pairing because the acidity and touch of sweetness helped to mellow out the spiciness of the dish. Please share in the comments what you would have paired with this meal. And, as always, we welcome your suggestions for challenging wine pairings for us to try in the future. 2011 Nefarious Cellars Riesling (Stoneâ€™s Throw Vineyard, Columbia Valley, Washington): Pale, greenish straw yellow. Nice nose with pear and Granny Smith apple aromas. More pear, apple, and orange zest come through on the palate. Off-dry and light to medium-bodied with crisp acidity and a long, refreshing finish. 2009 Saviah Cellars Malbec (Walla Walla Valley, Washington): Dark purple in color. Aromatic with black cherry, blackberry, spice, and oak on both the nose and palate. Full-bodied with lively acidity, high tannins, and a long finish. How about the Reininger Carmenere? I think that would be another great choice for this meal. Great to see the Wine Peeps at the Wine Blogger Conference. Great to see you and Sue at WBC12. Ah, Carmenere. Great suggestion! CÃ´te-RÃ´tie is great with spicy food. We considered trying a Syrah with this meal as well. Thanks for the recommendation.